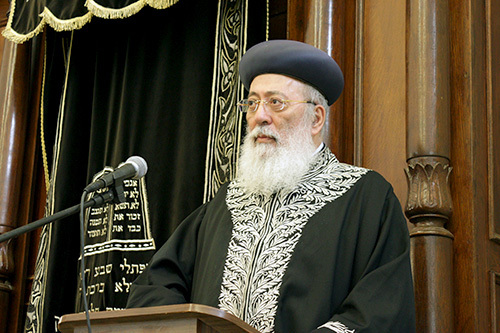 The former Sephardic Chief Rabbi of Israel recently visited the yeshiva and spoke to a full Beit Midrash prior to Shavout. I'd like to share with you his inspiring words as recorded in the notes of one of our talented rabbeim, Rabbi Yehonatan Peretz. I hope you enjoy the message as much as I and the staff and talmidim who were present at Rabbi Amar's historic visit. “The mishna in the beginning of Pirkei Avot teaches that the world stands on three things: Torah, avoda (worship in the Beit Hamikdash), and performing deeds of loving-kindness. However, Rabban Shimon ben Gamliel states in another mishna at the end of that same chapter in Pirkei Avot that the world stands on three different things: judgment, truth and peace. Rabbeinu Yona of Gerundi explains the difference. The first three things are the pillars of the world, he writes, and the world stands on them as the basis for the creation of our existence — but the world continues to exist in the merit of the second group of three reasons. The Beit Yosef, in the beginning of Choshen Mishpat, poses a question on this commentary of Rabbeinu Yona: If the first three things were enough to create the world, why are they not enough to keep the world in existence? Due to this question the Beit Yosef offers an explanation that differs from that of Rabbeinu Yona. 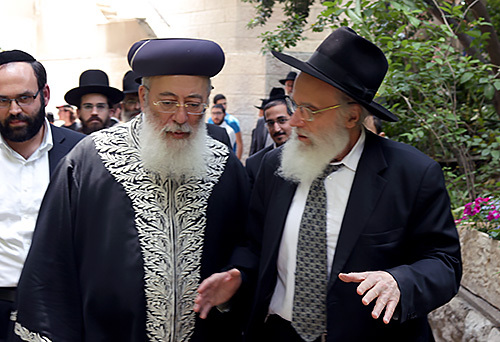 He states that the first three things were taught by Shimon Hatzaddik who lived during the time of the Second Beit Hamikdash, and therefore he said that the world stands on Torah and avoda (which was performed there at that time) and kindness. However the latter three things were said by Rabban Shimon ben Gamliel who lived after the destruction of the Beit Hamikdash, and therefore he mentioned three different things. But the Beit Yosef’s answer also appears difficult to accept. We can understand why avoda needed to be substituted for a different thing in the latter and later mishna because the Beit Hamikdash had already been destroyed and the avoda ceased — but why did he need to mention “substitutes” for Torah and for acts of loving-kindness? Clearly the Torah never changed and will never change! We humbly propose the following approach, based on an important concept taught by the Alshich Hakadosh. The verse states, “Behold, to G-d are the ‘Heavens’ and the ‘Heavens of Heavens’, the Land and everything in it (Deut. 10:14).” The order of the verse is perplexing. The ‘Heavens of Heavens’ are obviously higher than the ‘Heavens’, and it would therefore seem more logical for the verse to start with either the lowest level — the Land — or the highest — the ‘Heavens of the Heavens’ — instead of starting with the middle level of the ‘Heavens’! To answer this question the Alshich Hakadosh explains that at the time of the Beit Hamikdash the Land was the holiest and highest level because all of the holiness really has its roots in this world. Therefore, the verse is really in a logical order, starting with the lowest level and rising to the highest level. After the destruction of the Beit Hamikdash, not only was the avoda destroyed, but the high level of Torah and even the previous high level of kindness were also destroyed. As a result, Rabban Shimon ben Gamliel felt a need to teach three different things as replacements for the original three things that would serve as justification for a continued sustenance of the world. Ohr Somayach is delighted to announce the launch of Fusion - an electrifying and stimulating 4-week program for young Jewish men of allbackgrounds who are serious about gaining an understanding of Judaism. Nucleus -Start the day off with a bang with an in-depth examination of the key principles of Judaism and explore classic and contemporary issues. Formulas to Live By - Insights into practical day-to-day Jewish living. What, how, when and why. Bound to be a catalyst for conversation. Splitting the Atom - Getting to grips with text, guiding students through analyzing the Talmud and applying conclusions to the 21st century. Reaching to the Core - Life Skills and Self-Development 101, Jewish style. Heavy Water - Jewish thought and philosophy. Get clarity. Prevent a meltdown. 1:2:1 - Choose from a selection of guided study options. As part of its worldwide outreach and educational activities Ohr Somayach International recently held its annual North American Yom Iyun Evening of Learning entitled "Issues and Answers - Jewish Perspectives on Our Rapidly Changing World" in Baltimore, Brooklyn, Chicago, Toronto and Los Angeles. World-renowned speakers Rabbis Akiva Tatz, Dovid Orlofsky and Dovid Gottlieb dazzled the audience with their brilliant presentations on contemporary topics. Rabbi Gottlieb addressed the issue "Can Rabbis be Wrong? - Defining True Jewish Leadership;" Rabbi Orlofsky's topic was "How is Judaism Still Relevant Today?" and Rabbi Tatz spoke on "Is it Safe? Living in a Dangerous World." The annual Ohr Lagolah Kiruv Seminar for Bnei Torah will be held in the Main Beis Medrash of Ohr Somayach on Tuesday 17th Tammuz / 15th July. Speakers this year include the Rosh Yeshiva Rav Nota Schiller, Rav Moshe Shapiro, Rav Yitzchak Breitowitz, Rav Moshe Lazerus, Rav Zev Leff, Rabbi Dovid Orlofsky, Rabbi Dovid Gottlieb, Rabbi Moshe Averick and Rabbi Richard Jacobs. A full schedule will be available on the Ohr Somayach website from the beginning of Tammuz. https://soundcloud.com/jroot-radio/yosef-wikler-apr-07?in=jroot-radio/sets/kashrus-on-the-air and read the comprehensive article on this topic here: http://ohr.edu/this_week/insights_into_halacha/5390.